This page is written by the game's inventor, H. G. Muller. Elven Chess was conceived as a hybrid between orthodox Chess and the historical Japanese game of Chu Shogi, to allow a western Chess player to get a whiff of the latter. It was designed to be playable over the board with readily available equipment: one-and-a-half orthodox Chess sets plus an International Draughts set (checkers and board). 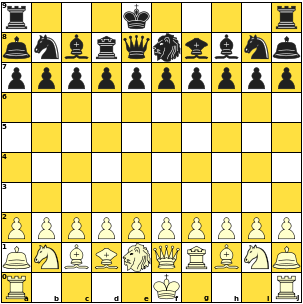 The participating non-orthodox pieces can then be represented by placing pieces from the second Chess set (only a single Rook, Bishop and Knight, plus four Pawns are needed of each color) on the pedestal of a Draughts chip, reminding the player that in addition to the moves of its orthodox counterpart, it now also has all moves of an orthodox King. In other words, the pedestal indicates the piece is now the crowned version of the original piece. The Queen, Rook, Bishop, and Knight move identically to those in orthodox Chess. Pawns do nearly so, and in particular can do an initial double-step from the 2nd or 7th rank, and can be captured en passant immediately after that. The only difference with orthodox Chess is that they promote already on reaching the 7th rank, (2nd rank for black). They can only promote to pieces from orthodox Chess, and not to Warlock, Elf, Goblin or Dwarf. Kings also move as in orthodox Chess, and can castle under the usual restrictions of virginity, clear path and not passing through check. On castling they move 3 squares towards the Rook, however, as is usual on 10-wide boards. The Goblin moves as Rook or King (the Shogi Dragon King, RF), and is represented by a Rook on a Draughts chip. The Elf moves as Bishop or King (the Shogi Dragon Horse, BW), and is represented by a Bishop on a Draughts chip. It can leap directly to any of the squares in the 5x5 area surrounding it (KNAD). It can capture two pieces in one turn. It can capture a neighboring piece, and go on to an empty square. It can capture a neighboring piece, and return to its starting square. It can effectively pass a turn by moving to a neighboring empty square and back. The Warlock (which you might have recognized as the Chu-Shogi Lion) is represented by a Knight on two stacked Draughts chips, to highlight its special powers. The aim is to checkmate the opponent King. It is not allowed to expose your King to capture, and stalemate is a draw. When the Warlock captures the opponent Warlock, it becomes 'royal' for one turn, which means it must not be exposed to capture, not even to capture by a piece pinned on the King. A Warlock can only capture another Warlock if it would have been safe for a King to end up where the Warlock did. When a non-Warlock captures a Warlock, the Warlock of the other side becomes 'iron' for one turn, i.e. it cannot be captured at all. These rules together make it impossible for two Warlocks to be captured in subsequent moves. This game is sometimes referred to as 'Chu Chess', to indicate its ancestry. The Warlock is immensely powerful, due to its ability to capture protected pieces and get away with it. Anything approaching a Warlock will usually be annihilated. Initially it is more valuable than Queen + Rook, although the latter gain more in the end-game from the increased mobility they get on a near-empty board. The crowned pieces are worth about 2 Pawns more than their normal counterparts. The game can also be played in a more Shogi-like version, ('Elven Shogi'), where Pawns capture straight-ahead rather than diagonally, and promote only to Dwarfs, while Rook, Bishop and Knight can also promote, by putting them on a Draughts chip. A Knight on a single Draughts chip would then just move like Knight or King ('Spider', KN, still a quite strong promotion, as it acquires eight new moves rather than just four, as R and B do), and will not get any special double-move powers. Yes, top heaviness is covered in the Rook level Chess thread. I have seen Elven Chess on chess.com and thank you for trying to expose them to something other than 960. Your ratios give me even more of a clue to your goals, and are good guidelines in general. We are both trying to introduce Chu Shogi pieces, but mine is a Grand Chess variant, so no castling. The array in Elven Chess demands castling to develop a Guard/Dwarf. Elven is tactically Chess with a Shishi. I want something that is more tactically Chu, in having a placement of minors behind majors, without the worry of what minors promote to or a horde of one step pieces. The ratio highlights the problem with all Capablancas, but people still keep putting them out there. Cetran 2 has only one minor piece, and I find it to be an enjoyable and balanced game. Minor point: I'm not sure I follow your math with the ratios, I count Elven as 2,4,6,10 and GCS as 2,8,5,10. My first thought is that your array might be a bit 'top heavy': you introduce many new pieces stronger than Rook, but no new minors. IMO orthodox Chess is such a well-balanced game because the number of piecesdoubles for each next-lower class: 1 Queen, 2 Rooks, 4 minors, 8 Pawns. Give or take a Pawn each piece is worth about twice as much as a piece of the next lower class, so you have many interestng 2-for-1 trades. This gives a much more interesting spectrum of material combination then when only trades within a class occur, because the next-lower class is in short supply and most of the pieces there are already traded against each other before the intrinsically rarer 2-for-1 trading opportunities occur. For this reason I did not only add Strong pieces (Shishi, RF, BW) to the FIDE array, but also the two Dwarfs (K). That gives one extra Rook-class piece (BW) and two extra Knight-class pieces, to preserve the ratio there, and one piece (RF) halfway between Queen and Rook. So roughly speaking you could say the Q:R:minor:P ratio in Elven Chess is 1.5:3.5:6:10, while in your array (similarly 'splitting up' the RF) it is 2:7:4:10. (The Stag should be worth about a Rook, if the King moves alone are already worth a Knight.) I would not expect a full-powered Shishi to be any problem in your array, because indeed the Stag is also 'Lion-proof'. It was not clear whether you propose this as a Chess or a Shogi variant (i.e. how the Pawns move, and if there is castling). I once tested an ordinary KNAD on 8x8, and it came out about 1.5 Pawn stronger than Q there. Q would benefit from a bigger board, though (more moves), while KNAD would suffer (longer travel times). Mr Muller, I am aware of your passion for Shogi and the Shishi in particular. My opinion is built on Mr Duniho's piece on designing good chess variants. I am interested in your opinion of my array, whether a Shishi or KAND is used? This is the most original of the the ones I am proposing for GC&B. I do not have the computer skills to create something like this on WinBoard or any of the others and I have not been able to play test it. The Flying Stag does fit into your criteria of crowned pieces. Well, the "Lion power" of the Chu-Shogi Lion (i.e. the ability to capture in passing) is all the fun, and my reason for designing Elven Chess was to make it accessible in a less intimidating game. Whether 10x10 is too small for it remains to be seen. I play-tested Mighty-Lion Chess, which has the Lion on an 8x8 board, with a computer, and the games this generated did not look especially problematic. Like in Chu, the Lions tend to seek each other, creating a stand-off, leaving their defensive position only after that has been made 'Lion proof'. Note that Mighty-Lion and Elven Chess are primarily designed as Chess variants, not Shogi variants. Chains of FIDE Pawns are much more Lion-proof that Shogi Pawns. Because the Pawns have two captures rather than one, Pawns standing shoulder to shoulder cannot be approached by a Lion from ahead. And interlocked Pawn chains, which are not possible with Shogi Pawns but common in FIDE, are also Lion proof. FIDE also is much more 'slider dominated' than Chu Shogi, and in Mighty-Lion one of the Lions usually gets lost in the early end-game because it can no longer hide from slider attack as the board population thins. In Elven Chess all the non-FIDE pieces have King moves, and thus cannot be approached by a Lion for an igui threat. So they don't have to rely on the Lion being far away for their survival. This variant gave me the idea for my Grand Chess and Beyond project. My idea is more inline with the nut shogis. I think the Shishi is to powerful for 10x10 and am going with a KAND Lion, plus it's a bit complex for beginners. I also wanted a Lance type piece on the edges and chose a Flying Stag. For "Grand Chu Shogi" King; F1 & 10. Queen; E2 & 9. Lion; F2 &9. Guard; E1 & 10. Dragon King; D2 & 9, G2 & 9. Dragon Horse; C2 & 9, H2 & 9. Rook; B2 & 9, I2 & 9. Bishop; B1 &10, I1 &10. Knight; D1 & 10, G1 & 10. Flying Stag; A2 & 9, J2 & 9.